(NY Times) -- No American is dedicating as much of his money to defeat President Obama as Sheldon Adelson, the casino magnate who also happens to have made more money in the last three years than any other American. He is the perfect illustration of the squalid state of political money, spending sums greater than any political donation in history to advance his personal, ideological and financial agenda, which is wildly at odds with the nation’s needs. 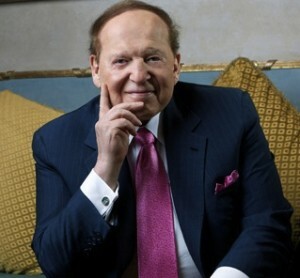 Mr. Adelson spent $20 million to prop up Newt Gingrich’s failed candidacy for the Republican nomination. Now, he has given $10 million to a Mitt Romney super PAC, and has pledged at least $10 million to Crossroads GPS, the advocacy group founded by Karl Rove that is running attack ads against Mr. Obama and other Democrats. Another $10 million will probably go to a similar group founded by the Koch brothers, and $10 million more to Republican Congressional super PACs. That’s $60 million we know of (other huge donations may be secret), and it may be only a down payment. Mr. Adelson has made it clear he will fully exploit the anything-goes world created by the federal courts to donate a “limitless” portion of his $25 billion fortune to defeat the president and as many Democrats as he can take down. The first answer is clearly his disgust for a two-state solution to the Israeli-Palestinian conflict, supported by President Obama and most Israelis. He considers a Palestinian state “a steppingstone for the destruction of Israel and the Jewish people,” and has called the Palestinian prime minister a terrorist. He is even further to the right than the main pro-Israeli lobbying group, the American Israel Public Affairs Committee, which he broke with in 2007 when it supported economic aid to the Palestinians. Mr. Romney is only slightly better, saying the Israelis want a two-state solution but the Palestinians do not, accusing them of wanting to eliminate Israel. The eight-figure checks are not paying for a more enlightened answer. Because of the lower tax rate in those countries (currently zero in Macau), the company now has a United States corporate tax rate of 9.8 percent, compared with the statutory rate of 35 percent. President Obama has repeatedly proposed ending the deductions and credits that allow corporations like Las Vegas Sands to shelter billions in income overseas, but has been blocked by Republicans. Mr. Obama’s Justice Department is also investigating whether Mr. Adelson’s Macau operations violated the Foreign Corrupt Practices Act, an inquiry that Mr. Adelson undoubtedly hopes will go away in a Romney administration. For such a man, at a time when there are no legal or moral limits to the purchase of influence, spending tens of millions is a pittance to elect Republicans who promise to keep his billions intact. Excellent article! Now I am waiting for THE article about how Sheldon Adelson, once a Massod operative, was involved in the assassinations of the Kennedy brothers. We have the facts. Those are no longer conspiracy theories. There are many more questions about Sheldon's nefarious acitivites, past and present, here and abroad, to be answered.